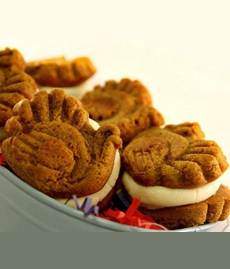 Seasonal whoopies in the shape of turkeys, plus pumpkins and leaves (not shown). Photo courtesy Cranberry Island Kitchen. These gourmet whoopie pies are a rich, full-bodied pumpkin cake. The selection includes both vanilla cream cheese filling and maple cream cheese filling. They’re also made in pumpkin shapes and maple leaf shapes; then individually shrink-wrapped to preserve freshness. They can be eaten at room temperature or straight from the fridge, and they freeze beautifully. The whoopie pie is Maine’s Official State Dessert, but the now-defunct Berwick’s Bakery in Boston (1898-1977) may have been the origin: A retired employee said that the company first started to bake whoopie pies in 1926, earlier than any other reference. The whoopie pie is actually a sandwich cookie: two round, mound-shaped pieces of devil’s food chocolate cake with vanilla frosting in-between. The recipe first appears in cookbooks during the Depression, in recipe collections from several states. Today there are dozens of flavors of cakes and fillings. There’s nothing left to do but take a bite.